Beneath the dated, harsh fluorescent lights of church basements, in the drab expanses of massive halls, men and women scan a dizzying array of numbered boards laid out before them with the casual, cool efficiency of air traffic controllers. They don't miss a beat, gossiping between mouthfuls of popcorn or long drags on Virginia Slims. Ears perk up eagerly as each number is called at eight second intervals --- an eternity when the prize is nigh. Eyes look intently to the surrounding monitors for that one desired ball. Ink dobbers are clutched tightly, deliberately, purposefully. "C'mon G-51! Let me hear N-33!" To some, it's a gamble, despite its charitable outcome. For most, it's just a night out away from the TV, a chance to kibitz with the girls or rehash war stories with the boys. And there are some who have chosen this as a career, hitting different spots each night. It's the thrill of the hunt, the happiness of pursuit. This isn't Vegas. It's not the track or the ring, either. Bingo's never been that glamorous. You can't picture The Rat Pack holding court in a bingo hall. And there's really no intoxicating, edge-of-your-seat excitement. I made my first descent into bingo's netherworld this fall. While playing, I felt my tension mount as I waited for tension to actually mount. Alas, it never really did. Bingo is slowwww, daddy-o. It's lethargic. The game's steady cadence is painfully boring at times. Though the promise of cash can be big, the payoffs are few and far between. Once recognized throughout the country as virtually a sacrament in the Catholic Church, bingo is slowly getting squeezed out of neighborhood parishes and VFW posts and into giant bingo halls, where patrons can smoke and the prizes are bigger. Ed Schmitt, who runs The Empire Statesmen's (a drum and bugle corp.) bingo at one of those halls, The Bingo Palace on East Ridge Road, blames building codes. "Building codes changed, and all of a sudden they redefined the types of occupancy, along with restrictions, particularly in regards to smoking," he says. "That was the death knell for the average Catholic school or VFW." The quest for the dollar did its damage, too. Though admission to both church and commercial halls averages around three bucks, when it comes to the payouts, the road forks. "When New York State changed the rules and let you offer more than $1,000 in prizes, that gave birth to these large, commercial bingo halls," says Joe Pocious, who runs what he calls "good, old-fashioned parish bingo" at St. Josaphat's Ukrainian Catholic Church in Irondequoit. The big halls "are able to give out $3,000 or more per night," Pocious says. St. 'Phat's offers a less-than-fat maximum of $1,500 at its Friday night bingo. "People are going to go where the prize money is," he adds. Bingo's history can be traced back to 1530 and the invention of an Italian game called Lo Giucco del Lotto D'Italia. In the late 1770s, it was introduced in France, where it was played among aristocrats and called Le Lotto. The Germans also played a version of the game in the late 1800s, and used it to help students learn math, spelling, and history. The game reached American shores in 1929, and was first played in a carnival near Atlanta, Georgia. A dealer would pull numbers from a cigar box as players marked their cards with beans, calling "beano" when they won. New York toy salesman Edwin S. Lowe mistook the winners' cry as "bingo," instead of "beano." Lowe developed the game with the help of Columbia math professor Carl Leffler, who increased the number of combinations in bingo cards to 6,000. According to author Mary Bellis' essay, "The History of Bingo," rumor has it that Leffler then went insane. In the late 1920s, Lowe was approached by a Catholic priest who wanted to use bingo to improve his church's bottom line. Lowe helped the priest set up a game, and within a few short years, bingo spread up and down the East Coast and was moving west. By 1934, an estimated 10,000 games were being played. Today, bingo has evolved to include shape-oriented games like Bowtie, Goal Post, Crazy H, and Small Diamond. Cash prizes vary, especially when there's a "split pot" --- that is, when a small percentage of what the players kick in goes back to the house. Hard figures on bingo revenue are hard to come by, but there's huge money involved. For instance, according to the Soda Springs (Idaho) Chamber of Commerce website, gross bingo receipts in New York State alone were $166,293,430 in 1995, of which bingo purveyors kept $36,688,872. Most of the church bingos I attended seemed like pot-luck suppers without the food. At least, not the homemade type warmed over in Corning Ware I'd hoped for. The grub was mostly popcorn, candy, soft drinks, coffee, and hot dogs kept hot on World War II-vintage rotisseries. The warm buzz of conversation and the high-pitched giggles of rambunctious rug-rats is kept low; you don't want to miss those numbers. But the hushed atmosphere is inevitably punctured by the infrequent victory cry of "bingo," followed by audible groans of dissention and defeat. Thanks to the advent of commercial bingo halls, you can play all day, seven days a week. Various churches and charities rent out the halls. The volunteers who run the games are parishioners or members or the various benefiting charities. The players, more often than not, are not. This is true even of those games still held on church property. "It's 99 percent non-parishioners," says Pocious, "and some aren't even Catholic." Ninety-nine percent of the bingo players I spoke with refused to give me their last names, citing such reasons as bashfulness, marital deception, and addiction. Warren, a player at St. Nicholas' breakfast bingo at The Patriot Bingo Hall in West-Mar Plaza, is essentially a bingo pro. Between bites of his fried egg sandwich, he tells me he plays seven days a week and pretty much breaks even. But to older players like Warren, it isn't all about winning and losing. 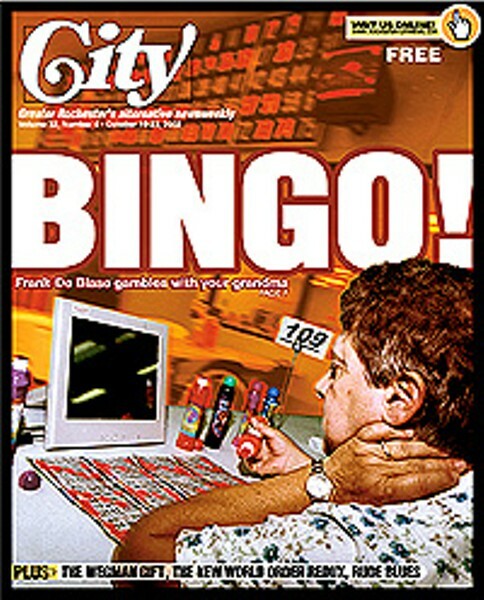 Bingo is the primary social activity for a lot of seniors. "You meet other regulars and new people at the games," Warren says. "It keeps you going, keeps you young." "What else should I do?" asks Margaret incredulously. "Sit home alone and wait for my kids to call?" Of course, there are those for whom winning is everything: the bingo veterans with fingers crossed and eyes afire. You know the ones: ladies with bingo-embroidered sweaters, an arsenal of dobbers, and an immense spread of boards before them. These are the players who will curse you under their breath when you call "bingo" before they do. And who knows what other mojo they're working? Whether it's a quick shout-out to St. Bernadine of Siena (the patron saint of gamblers and the closest holy figure I could find to a patron saint of bingo), or the wearing of a lucky hat, all players concede it's pure chance. "It's just the luck of the balls," says one lady. Another lady I met was counting on divine intervention. "Hopefully, He's listening to you up there." And hopefully, in addition to a new school bus for the parish, He wants to see you knee-deep in cash. "It's relaxing, even though it's stressful," say two women who requested their names be withheld pending the outcome of the game. They'd told their husbands they had gone shopping. "We'll tell 'em [we were playing bingo] if we win. Then it'll be okay," says one. Whenever money is paid for the chance to win more money, it's gambling, plain and simple --- though many bingo players and enablers are as elusive as politicians when pressed on the subject. "We're just here to pay off the mortgage," says Father Ken of St. Nicholas Church, which sponsors "breakfast bingo" at Gates Bingo Center to benefit the church building fund. "It ain't gambling," one woman tells me, her hands on her hips, boards spread out before her. "Because I don't gamble," she says. On the other hand, Sharon, a laid-off Kodak employee, gambles. She says she blows up to $80 a day on bingo. This, despite the fact she increases her odds of winning by playing several dozen paper boards at once, in addition to using a computer that can keep track of up to 54 boards. Though she said she'd already won $3,500 this month, she didn't look like she was having any fun. In fact, she wants to quit. "My mother died three years ago, and I didn't want to get involved in drugs or go out drinking, so I started playing bingo," Sharon says. "I won $1,800 right off and haven't stopped playing since. I want to, though. It's a vicious cycle." "A gambler always tells you what he's won," says Frank Barattini of St. Theodore's Church on Spencerport Road. "And very seldom what he loses." The exodus of bingo players from churches to commercial halls is taking a toll on parish coffers. "We have three sources of income," says Pocious: "The Sunday collection, our annual Ukrainian Festival, and bingo. We could probably operate without bingo, but it would be a struggle." Bingo pays the church's fuel bill and electric bill. The game's income is so important to the parish that they maintain a former school building on the premises exclusively for Friday night bingo. Still, the take's not the same as it was in the past. "We've done it for 32 years," Pocious says. "And each year it gets a little harder. The revenue is dropping." "When everything was going good, [bingo revenue] was probably around $45,000-$50,000 annually," says Schuler of St. Cecilia's. "It's nowhere near that now." Bingo is so important to St. Cecilia's that parishioners paid to construct a glass-enclosed area to accommodate smoking bingoers, who make up almost 50 percent of the players. Apparently, bingo and nicotine go together like peas and carrots. Though I have plenty of well-traveled social avenues already, walking in bingo shoes this past month has given me insight into a seldom-seen side of American life. Sadly, this subculture is diminishing in intimate, suburban parishes --- where I had a better time than in the mega-halls. I'm convinced I'll never get rich playing bingo --- and you're kidding yourself if you think you will. But I got to rub elbows with interesting characters, hear a few stories, share a few laughs, eat junk, and win a few dollars. Six bucks, to be exact.